WEST LAFAYETTE – When Alexis Prater was 10, she asked if she could go to a track meet. “It was winter, but my dad found an AAU indoor meet and that started it all,” said the Ridgewood High School senior. Alexis’ father, Jason Prater shared that same story on Nov. 20, right before she signed her letter of intent to continue her track career at Division I Youngstown State. Alexis’ specialties are the long jump and hurdles and she plans to do both in college. 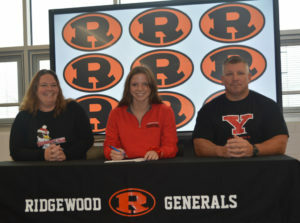 Alexis’ mom, Maria Prater is happy to see her continue her track career at Youngstown. The university was one of the last that Alexis visited. Darrell Ball, girls track coach at Ridgewood, said Youngstown is getting a dedicated, team player. Assistant Coach Dan Smith added that Alexis is very coachable. “She listens, absorbs and works hard on her own,” he said. Alexis is appreciative of her coaches and several others for helping her get where she is today. Alexis is undecided at this time on what her major at Youngstown will be.